Today’s sports fans expect an amazing experience when they attend sporting events, and a fixed-digit metal box scoreboard simply can’t live up to the expectations of today’s fans. 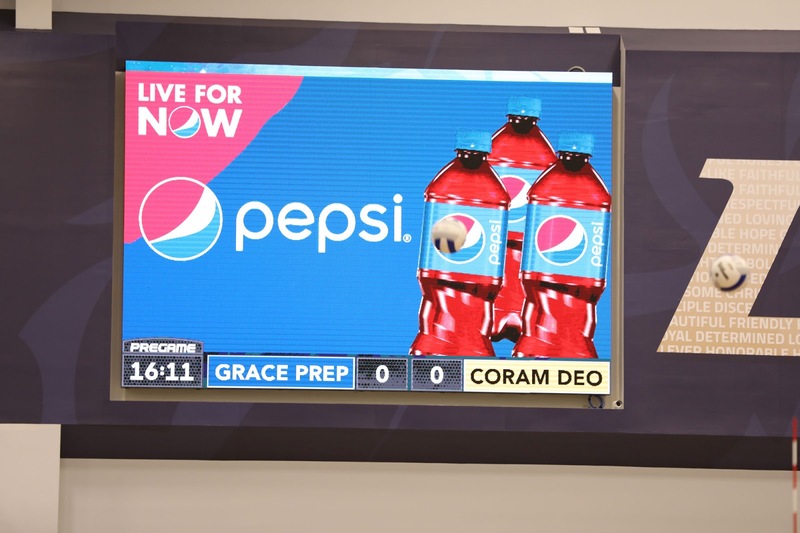 Explore how upgrading a traditional scoreboard to a ScoreVision multimedia jumbotron can transform your high school gym or stadium into a professional arena! In professional arenas, the amazing experience that today’s fans expect is delivered through an immersive combination of lights, sound, and video. A ScoreVision multimedia jumbotron helps you deliver this immersive experience at your own facility through its rich multimedia features, including sport-specific animations, live video feed, one-touch player accolades, leaderboards, animated player profiles, and more. Get the crowd excited with sport-specific animations that highlight every play, like “Three-Pointer”, “Goal”, and “Touchdown”. Recognize players for incredible plays with one-touch player accolades right from our easy-to-use Scorekeeper Apps. Visualize top-performing players with a dynamic leaderboard featuring players’ photos. 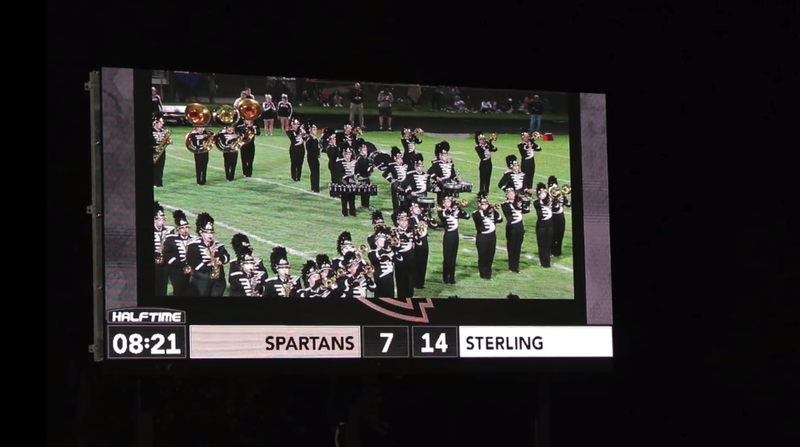 Check out these features in action in this short video featuring our multimedia football jumbotrons! Don’t let your gym or stadium sit idle during the week when games aren’t in play. A ScoreVision multimedia jumbotron allows you to host any number of community events in your facility – think movie nights, concerts, fundraisers, marching band competitions, robotics competitions, and almost anything you can imagine – all elevated using ScoreVision’s easy-to-use event production software and multimedia jumbotron system. Whether fans are in the stands, at home, or on the other side of the country, they can stay in the know with ScoreVision’s Fan App. 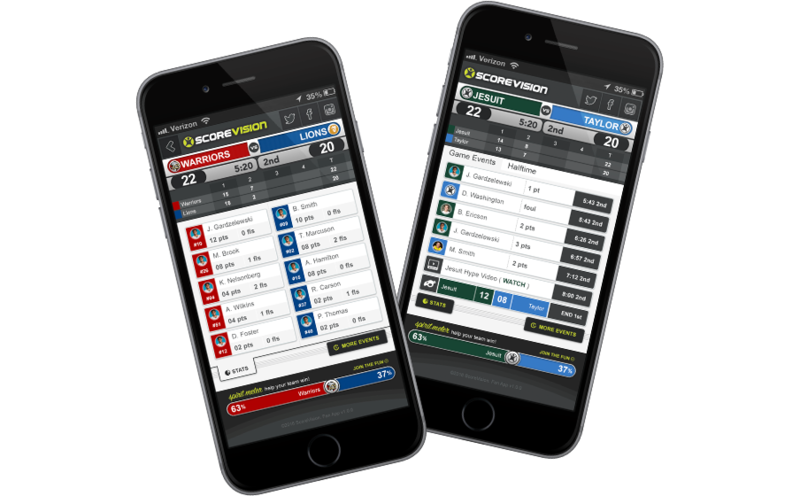 The ScoreVision Fan App for iPhone and Android delivers real-time game stats for any game played in a gym or stadium that has a ScoreVision system. Plus, the Fan App displays the same ads as your multimedia scoreboard, so your advertisers and sponsors get additional reach – helping to bring back their support year after year. ScoreVision multimedia jumbotrons are already one of the most affordable video scoreboard options on the market for athletic facilities, but they can also become a revenue-generating system. Schools across the country have alleviated fundraising challenges by raising tens of thousands of dollars for their athletic programs through the digital advertising capabilities of a ScoreVision system. This number can be increased even further by following in the footsteps of professional arenas and adding in sponsored segments to your announcer scripts, facilitating sponsored giveaways, fan activities, and theme nights, plus any number of creative ideas that your school’s students may have. Better yet, providing a professional-level fan experience at your sporting events doesn’t just bring in additional sponsorship dollars – it can also increase ticket sales and concession stand sales! The immersive experience of professional arenas provided by ScoreVision jumbotrons is helping schools to attract advertisers ranging from local businesses to large, national corporations – and these sponsorship dollars can help sustain your athletic program for years to come! High schools, community colleges, and universities alike are finding incredible success transforming their gyms and stadiums into professional arena experiences with ScoreVision multimedia jumbotrons. To learn how your school can benefit from a ScoreVision jumbotron scoreboard and software system, contact us today! Interested in learning more? Check out last week’s blog post on how ScoreVision jumbotrons are elevating soccer games this season and stay tuned for next week’s post highlighting how ScoreVision helps colleges with recruiting, elevating their game-day experience, and more!